That is a photo of a big bull pulling a big cart of handicrafts. I am surprised to see this because I do not expect to see a handicraft caravan in Metro Manila. That is why I never hesitated to take a picture of this. When I was a child, caravans like the in the picture is so common. Every summer, farmers place their handicrafts and other products inside a big cart to sell to different parts of Luzon. They sell brooms, baskets made of rattan, sepak takraw balls, and other products made of rattan and other materials that can be found in the farm. Now, it is quite rare to see such caravans. Maybe the reason for this is that many of the farms in Rizal, Bulacan, Laguna and Cavite were all transformed into subdivisions. Also, I think that only few people buy farm-made handicrafts that is why many farmers are not that motivated to make and sell handicrafts. At least some farmers still make handicrafts and bring their products to Metro Manila. The handicraft caravan is still, somewhat, alive. Visit Ahab Reviews and Tips and read about PHIVOLCS information regarding Taal Volcano. Nice. Very interesting. One day, all these unique sights will be completely gone. akala ko kabayo lang ang humihila ng ganyan....pati din pala ang bull..
Yup. Kasi ang mga magsasaka ay meron nang alang mga baka or kalabaw kaya sila na rn ang pinaghihila ng mga ganitong cart. Baka yan. Tingnan mo yung balat niya. Maluwang. Di katulad ng sa kalabaw na walang excess skin. Oh! Too bad I didn't bump into one of these handicraft caravans when I was in Manila. I would surely take a picture of it! Haha! Nakakatuwa naman makakita ng ganito sa Manila. I'm sure nag-stand out yan in the middle of those buses, cars and jeepneys. Buti nalang meron pa ding iilang farmers na nagpapatuloy nito. Isa to sa mga authentic Filipino tradition natin kaya nakakalungkot naman kung mawawala. I think all we can do is to buy their products to encourage the farmers to continue this handicraft caravan. Yeah, because it is a rare sight, it will be improbable for you to see one of handicraft caravans, especially in the chaotic Manila. We can encourage them by doing your suggestions. I hope na maibalik itong tradisyon na ito. Maganda sana na makita pa ng ating mga kabataan ang ganito. 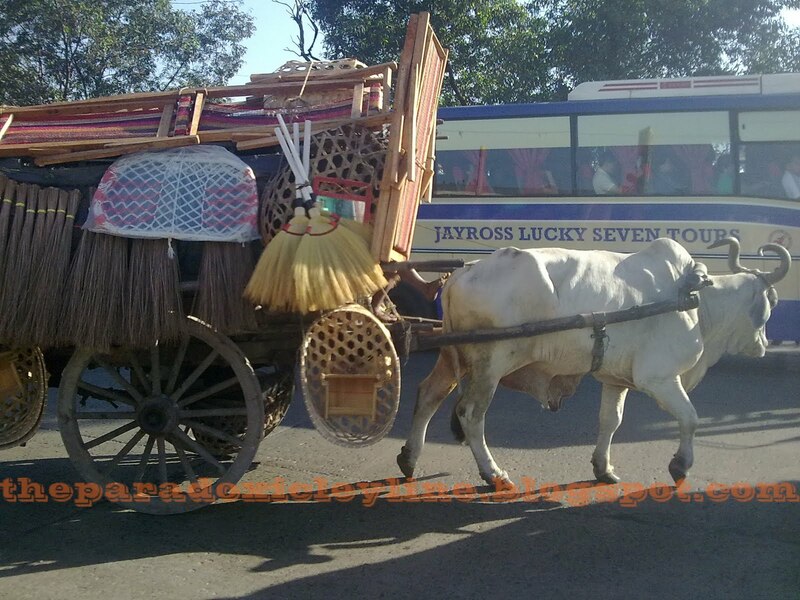 This Cattle Caravan Originated in our province Pangasinan particularly Interior Caboloan or Central Area of Pangasinan particularly in San Carlos City. Kaya galing pa sila ng Pangasinan hanggang makapunta ng Southern Luzon yung iba naman sa Ilocos ang punta nila. it's either Baka ang gamit o kaya Kabayo.